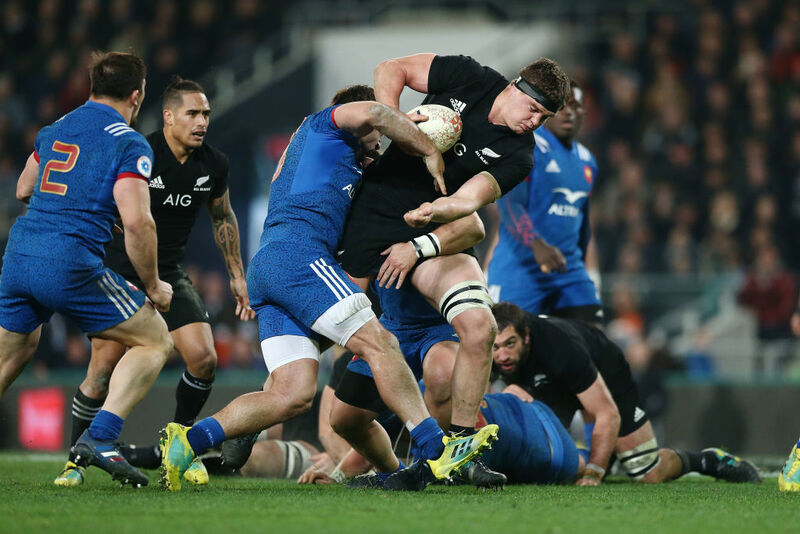 The All Blacks managed to silence some of their critics with a scintillating second half performance against France in the third test on Saturday, but coach Steve Hansen was pleased it was just another step on the way to next year's World Cup. The All Blacks fielded arguably one of their most inexperienced sides in the last decade with four debutants and only two starting forwards with more than 50 caps each, while Damian McKenzie was starting his first test at flyhalf. After facing an arm wrestle for the first 45 minutes, however, they cut loose in the final 30 as they ran in four unanswered tries, three to winger Rieko Ioane, to win 49-14 and sweep the three-match series. "Pretty happy," Hansen said of the nature of the victory and the development of his side throughout the series, which he had targeted as pivotal for developing the tactics they will take into next year's Rugby World Cup in Japan. "We made some improvements. The attitude was a lot better and some of the things we were working on are starting to pay off. "We will sit back and reflect on the series over the next week or so and have a look at some of the critical stuff we were working on. "You have to take it. It's three test matches. They're always hard fought so you have to take it." Hansen had also hoped to develop more of his fringe players during the series, particularly in the third game in Dunedin and the performance of lock Scott Barrett throughout the series showcased those development plans. Barrett was really thrust into the starting role for the series after Brodie Retallick was ruled out with a broken bone in his chest, but he got more involved in each game and was arguably the player of the match at Otago Regional Stadium. "We had a lot of young fellas out there and I think we have got a marker on them," Hansen added of the impact of the likes of prop Karl Tu'inukuafe and debutants Jack Goodhue, Shannon Frizell and Jackson Hemopo. "Scottie's (Barrett) test was probably the best one he's played in the jersey. He's playing really really well." France stand-in captain Baptiste Serin, who was an early replacement for Morgan Parra, said the All Blacks had been difficult to stay with in the second half of the match, but he was pleased with their own development during the series. "Playing the best team in the world does give you experience," Serin said through an interpreter. "We are a young team and we played a good first half. "We were thinking we might be able to get a victory here but it was too hard and we did learn a lot through this series."